Maximize your impact in less time with a content plan! Quality includes, but is not limited to value, transparency, accountability, credibility, relevance, and authenticity. Those who aim to achieve quality don’t forcibly throw themselves at their audience with questionable practices or create risk for their audience. Instead, these agents of quality adopt a method that increases awareness in who they are and what they do or provide: branding. From names, symbols, logos, slogans, etc., branding differentiates you from other organizations or businesses. It helps you create an identity with which you can shape how your audience perceives your brand. Branding consistently will help build audience confidence, trust, and loyalty. It will also help you save time and money as well as strengthen your organization’s sense of self by identifying your mission and vision. 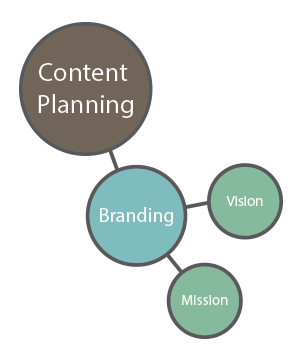 Mission and vision statements are a must-have for content planning. Not only are they used as branding tools to increase transparency, accountability, and authenticity, mission and vision statements are an alignment tool to help plan, position, and meet your bottom-line. What is the purpose of your platform or organization? What is your organization’s cause and effect (e.g., “we do this” and “this happens”)? What role does your organization play in the world? What would your organization’s headline be 5 years from now? Once you have your mission and vision established, you can begin identifying your core values and creating your brand identity (how you want the audience to distinguish your brand). When building trademarks, logos, graphics, etc., use your mission and vision statements to guide your brand development. Branding is the first step to developing a long-term content plan that will be easy to reiterate, adapt, and develop. In turn you will increase transparency and authority, as well as build awareness and trust by providing quality content and a quality user experience. From audience targeting to measuring to reiterating, we’ll show you more content planning strategies in the next few weeks, so stay tuned! I can attest to the article above. I bought an eBook called “Constant Content: The Google Gift” (you should bring him on board, a content master) and it opened my eyes. Content is not just putting the minimum amount of words into a blog or article, it is as stated having a plan. Since I focused my work, my results have increased over 1800% for both traffic and sales. I think it is important that these guidelines be used in all aspects. These are basic business and marketing principles, and folks will often stray so easily from these pillars or foundations! Thanks Vanessa great points to keep the ‘pencil’ sharp! I like branding, but i like direct response marketing better. I feel that branding will be achieve within your customer database with the more people who interact with your website, buy products, and get to know you as an individual. Very interesting blog post and thought provoking ascertains. Quality and authenticity in particular, is one of the things that is lacking in article writing on the internet today, despite Google efforts to clean things up. Content planning with branding in mind is something I shall definitely give attention to, as giving value to the reader, being authentic and credible is not enough if you want to leverage your writing efforts. I don’t have much time to leave comments usually, but I liked your post so much that I made an exception. I’ve been doing some study on branding at present and have found you could practically substitute the word ‘branding’ for ‘authenticity’-which is where my focus has long lay. Be who you really are! Aligning with one’s authentic nature illuminates a path at their feet and makes the way so much clearer, cutting out clutter and honing in what really counts. With all respect Randall, I don’t think your understanding of ‘branding’ is the same as my definition of it. I am my brand. It is my identity. I believe I understand what you are saying about developing a track record with your clientele, but there must come a time when that track record becomes your reputation and when it has, in my opinion, it has become your branding to them. But long before that…my belief about myself brands me-locating me in relation to who and where I want to be. My track record in my business dealings can certainly help me develop that. Having a clear view of what that is at the outset enables me to offer some guarantee based upon it. I think the biggest problem is that most people haven’t spent enough thought on their purpose in life, so haven’t the clarity of a personal mission or vision statement. I guess I’m seeing business as simply another expression/tool/vehicle for fulfilling that. My product/service is my advance into the material world that carries and conveys my dream to others-hopefully to their enrichment. Content planning should be applicable to all that we want. Getting the content well planned, will not only simplify the doings, it will as well attract attention, there by bringing about the achievement of the desired goals. This piece of note is indeed and in need, a want and must for all that nurse great achievement now or later. Keep the good works up, please. Wouldn’t content planning make creating content more difficult? I mean, this would likely increase the time it takes to create a routine blog post. I have always struggled with this concept as a student, either in high school or during university. I know from experience that creating a great essay is more about preparation than with the actual essay. Often, it takes more time to plan out the essay or paper than to actually write it out. In a recent paper on cardiology, I received a 20/20 mark on the quantity, grammar and quality of my paper’s presentation but I failed to actually answer the instructor’s question that my paper was supposed to answer. Thus I just received a passing mark for a total of 60/100 (60% was a pass). Thus, taking the time to write out a content plan may have took a few extra steps, but it could have saved me a lot of hassle and headache in the long-run! Thank you very much for the insight. Thanks so much for this top article. Is helping me a lot with writing good quality content. I have just started writing articles for my sites (so am not great at it at the moment) so i need all the help I can get. Thanks again. We here the term “branding” and automatically think that it is fix-all solution to a business gaining the type of exposure its creators desire. The truth in business is that no amount of salesmanship will sell ice cubes to Eskimos. By providing a structured format to a business’s literary needs, a Brand Writer can develop a system of wording and imagery that works well for the needs and future growth plans of that business. By avoiding the clichs and “insider or trade jargon”, the literature developed by the writer will provide a clean landscape for the “casual customer” to walk through. Even the prospective big wigs of industry and science will appreciate a simple and well-articulated document over a complicated treatise of jibber jabber! One of the books I read was “From good to great”. There’s a section that talks about the hedgehog process. I think this is what the article means to me – stay focus on the vision – it’s your GPS. I was aware of the importance of Content planning, Branding, vision and mission. But Vanessa has explain it in such an easy way to understand and to transmit. For sure, I will be using this article to help me draft my branding, vision and mission. Thank you so much Vanessa. I’ll keep this article for future reference. Quality is a perception. Quality content to some SEO writers is different than quality to a website blog owner, who may wish more proactive sales oriented content rather than search engine friendly. Mostly if it interests you for any reason, its probably quality for many reasons.